HAKEN, one of progressive music’s most exciting bands, recently announced details of their much-anticipated fifth studio album titled ‘Vector’, due for release on October 26th, 2018. The album was produced by the band themselves, and recorded & mixed by Adam ‘Nolly’ Getgood (Periphery, Devin Townsend Project), with the artwork once again being handled by Blacklake. The band will embark on an epic tour starting this October in North America, with dates in South American & European tour dates for 2019. Their fifth studio record sees the band going in a heavier direction with the music. “We’ve always had a heavy influence”, explains guitarist Charlie Griffiths, “but it was obvious from the riffs that were naturally coming out of us early in the writing process that this would be a more metal album. These are some of the most riff driven songs we’ve ever written.” As is usual, Haken produced the album themselves, but for the first time they have enlisted Adam ‘Nolly’ Getgood during the recording and mixing stages. Formerly bassist with Periphery, in the last couple of years he has built a reputation as a fine producer. “We produced the album ourselves, as we always do,” insists Jennings. “But we’re fans of what Adam has done with Periphery, Sikth and Devin Townsend. He has a great reputation for the heavier end of our genre”. But if this album is musically heavy, then there’s an underlying theme running through the seven songs which is certainly esoteric and fascinating. “The scene is set with the track The Good Doctor, which was a really fun song. 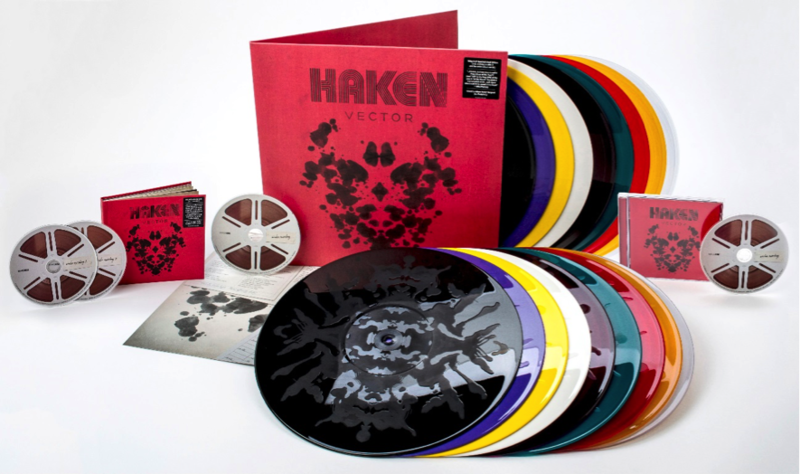 Musically it feels like a logical step from ‘Affinity’, but lyrically it’s a bit more theatrical and about as ‘rock opera’ as Haken has ever got”, explains Griffiths. “It’s about a Doctor with an intriguing, perhaps sinister interest in a particular patient. From there the story enters the point-of-view of the patient – who appears to be catatonic, but his mind is sparking with what could be memories, or delusions brought on by the treatment he’s receiving – we leave this up to the listeners to decide. Although we don’t want to give too much away, people who are familiar with our back catalogue will have fun discovering further clues we’ve planted throughout the album. And that’s the challenge for the fans – to find out for themselves their own meaning for ‘Vector’ as an album”.